Quartet for Strings #10 in E Flat Major, Op. 74 "Harp"
Quartet for Strings #11 in F minor, Op. 95 "Serioso"
Quartet for Strings #12 in C minor, D 703/Op. posth "Quartettsatz"
Yet another excellent collection of pristine recordings by a première ensemble finds its way onto Decca's Original Masters series of box sets. 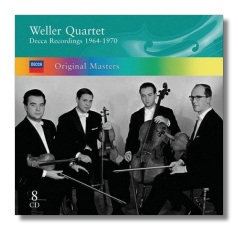 This time it is the Weller Quartet's turn, a quartet formed by the energetic Walter Weller in a smattering of 60's and 70's recordings in varied classical and modern repertoire. The Haydn quartets take up the first two CDs and most beautifully played they are with #4, Op. 33 particularly buoyant and colourful. I also enjoyed the Beethoven 'Harp Quartet' with Weller and Weis combining quite beautifully in their ensemble playing. Rarities also find their way into the set in the shape of quartets by Dittersdorf and Vanhal, both given equally splendid interpretations in quite stunning sound. I did find the ensemble slightly on the cold side in the Mozart quartets especially the 'Prussian' but the stunning sound definitely does not detract from the overall enjoyment of proceedings. The Brahms Op. 51 Quartets also reach a high standard of execution as does the magnificent Schubert Quintet, although here I feel that the Alban Berg Quartet and William Pleeth have thumbed deeper into proceedings. The final disc is very short at just under 45 minutes and consists of a blazing interpretation of Alban Berg's quartet and Shostakovich's Op. 118. Although the Weller's were the dedicatee of the latter, I do feel that the Fitzwilliam String Quartet and more recently the Shostakovich Quartet have brought greater feeling to Op. 118. These minor qualms apart, this is indeed a stupendous set all round and deserves an unqualified recommendation. Notes are rather sparse but at the price, any lover of the genre must investigate and acquire.